I made bread crumb pudding for the opening party of Welcome Back Ye Annunaki at Victoria’s Open Space. You might have heard that there is a food shortage here on planet earth. It’s all lies, lies, lies. There is in fact enough food for everyone and this shared meal is proof of that. None the less, some of us who live in the wealthier nations on the planet have a nasty habit of being wasteful. We throw out perfectly good food, while we let others go hungry. I want to show you that we’re not all like that, so I made this pudding from bread crumbs saved in my freezer. Yes, bread crumbs… I hope you enjoy it! I was going to the Friday night opening party for Welcome Back Ye Annunaki at Open Space, and as it was a pot luck supper I needed a dish. It was 9:00pm Thursday evening, Friday was booked full of appointments, so I had to make it Thursday evening. I looked in the fridge, I looked in the cupboard and groaned. There wasn’t much of anything to make anything with as I really did need to go shopping. So I looked in my recipe books and did an internet search for bread pudding and bread crumb pudding, and started cooking. These measurements are approximate as I just put together what I had, and improvised as I went along to make up for missing ingredients! 4-6 cups stale bread broken into cubes and bread crumbs. I had both in my freezer, most of it home-made, whole wheat porridge bread, a few slices store-bought whole wheat, a few slices white rye, and most of a loaf of bread I’d made that hadn’t turned out. Quantities are all guesstimates – all the ingredients filled a bowl 7.5 inches diameter x 5 inches deep. In fact I could have used a bigger bowl as when I added the ginger water (next ingredient) I had to turn some of it into the saucepan to mix, then turn it back into the bowl – it was messy! Then I read a blog recipe from a woman who mixed and baked her whole pudding in the same Pyrex container! But hey, I was improvising. 1 cup of water. You want to infuse the water with the ginger flavour. Turn into greased Pyrex baking dishes (preferably with lids), and bake for about 45 minutes at 350 then turn the oven down to 300 and bake another 45 minutes, removing the lids for the last 15-20 minutes. I ate the small pudding fresh from the oven (a late supper?) gave 1/2 a pudding to my mother, put 1/2 a pudding in the freezer and took 1 pudding to the party, cut into small slices (2 fingers). I was thinking slices big enough for people to have a taste, not so big they’d be embarrassed if they didn’t like it. 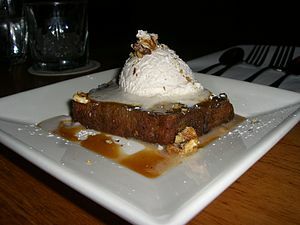 Besides, bread pudding really needs some kind of sauce. Though I have been eating this cold, sliced and spread with butter! Don’t throw out those bread crumbs left in the bottom of the bag, or those last few slices that have lost their ‘freshness’. What to do with all those crumbs lying on the bread board after cutting a slice of bread? …the authors of the books said that if every one of the nation’s 20,000,000 homes wasted one slice of bread a day, that equaled 319,000,000 pounds of flour a year. I have been guilty of throwing out heels of bread.